Great to have a picture of you both. Whereabouts is Maneru? How long before you get to Santiago (?) assuming you're going all the way. 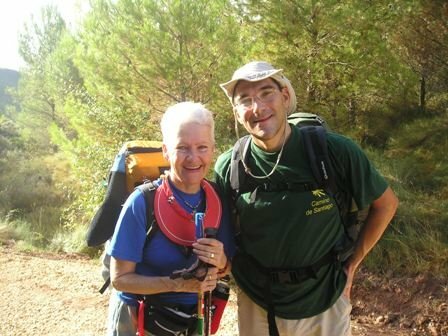 The photo was taken on 27th August when we both happened to be walking between Puente la Reina and Lorca - Maneru is about 4.5km from Puente la Reina. Javier recognized my South African flag and asked if I knew a woman named Sil! It was wonderful to meet him and Fernando. Yes, it was great for me because I knew Sil was walking but I thought she was one day back. Two weeks ago we were near to meet Javier, he was walking one day before us. Cool pic and it's nice to see the people we chat to on the net. I've been absolutely snowed under since I came back to work. Doesn't seem like only 5 weeks ago I came back. Can I walk for Javier, a dead man?